1Department of Entomology and Plant Pathology, Mississippi State University, Mississippi State, MS.
2USDA-ARS, National Biological Control Laboratory, Stoneville, MS.
Abstract: A study was initiated to identify the origin of polygyny in the hybrid imported fire ant (Solenopsis invicta × richteri) and to confirm the association of polygyne phenotypic and genotypic characters. Polygyny is known to occur in both species in their native ranges in South America. Gp-9, a major gene in imported fire ants, is associated with the expression of social form. Variants of the monogyne allele, Gp-9B, and the polygyne allele, Gp-9b, have been sequenced for both species. The association of phenotypic and genotypic characters in a hybrid imported fire ant colony is strongly indicated by identification of multiple inseminated queens in a colony and sequencing the critical 1.6-kb region of Gp-9 in hybrid individuals with a polygyne allele. A 99.6% match of the Gp-9b allele and concordance in the critical amino acid substitutions of the Gp-9 locus in the hybrid fire ant with S. invicta Buren provides evidence that polygyny in the hybrid imported fire ant is derived from this fire ant species. Imported fire ants in the genus Solenopsis (Hymenoptera: Formicidae) exist primarily in tropical and subtropical areas (Buren 1972). Fire ants are conspicuous elements of the ant fauna of the southeastern United States because of the large size of their nests and aggressive habits of the workers. In the early 20th century, fire ants that were native to South America were introduced to the United States through the port of Mobile, Alabama (Wilson 1958, Lofgren et al. 1975). Initially two forms were identified in the introduced fauna and recognized as subspecific variants (Wilson 1953, 1958). In 1972, Buren assigned species status to both forms based on morphological characters. S. richteri Forel, the black imported fire ant, which was introduced prior to 1920, was replaced in much of the southern United States by S. invicta Buren, the red imported fire ant. S. invicta, introduced in the 1930s, rapidly colonized most of the southeast and south-central United States. S. invicta has become a devastating pest since its introduction, and is estimated to cause $6 billion in damage and control costs annually (Core 2003). S. richteri is confined to a very limited geographical area that includes western Tennessee, northern Mississippi and northern Alabama (Oliver et al. 2009). Two gas chromatographic studies of fire ants collected at the contact zone of S. invicta and S. richteri in Mississippi were conducted in the 1980s (Vander Meer et al. 1985. Ross et al. 1987). Through the examination of the two imported fire ant species’ cuticular hydrocarbons and venom alkaloids, it was confirmed that hybridization had occurred. Streett et al. (2006) reported the presence of a zone of hybridization between the red and black imported fire ants in central to northern Mississippi and Alabama and southern Tennessee. Gardner et al. (2008) reported the presence of Solenopsis invicta × richteri (hybrid form) in northwestern Georgia, northern Mississippi, and Alabama. They reported that hybrid fire ant colonies might be better adapted to cooler and more northerly latitudes than S. invicta. The first populations of S. invicta discovered were monogyne colonies, in which a single queen and her workers were hostile to individuals from other colonies. From the 1970s to the present, polygyne colonies have been found with increasing prevalence. In these colonies more than one queen was present numbering from 2 to 200 (Ross and Keller 1995). The reasons for the evolution of a more unicolonial form of polygyny in S. invicta in the U.S. are not clear and may be due to the greater ecological success of this social organization (Ross and Keller 1995, Chapman and Bourke 2001). This represents a major social polymorphism in fire ant populations. The fundamental difference between the two social forms of fire ants is associated with variation at or near the Gp-9 gene and the number of queens. For both fire ant species, the colony organization and the number of egg-laying queens are associated with variation at the Gp-9 gene. In the monogyne form, the queen and workers all have the Gp-9BB genotype whereas workers in the polygyne colonies have both Gp-9BB and Gp-9Bb genotypes. Studies of S. invicta reported that queens of the polygyne colonies were almost always heterozygous for the Gp-9 gene and were rarely Gp-9bb (Keller and Parker 2002). Gotzek et al. (2007) reported that the expression of polygyny in South American fire ants was dependent on some combination of the three characteristic b-like cysteine residues that result from substitutions at codon positions 42, 95, and 139 in the Gp-9 gene. Some South American polygyne S. invicta sequences and all polygyne S. richteri sequences depict a b-like Gp-9 b allele for which there are no substitutions at the 151 or 152 codons relative to those of the Gp-9 B allele. Due to the Gp-9 allele or a closely linked locus, a worker with the Gp-9b allele will selectively kill queens with the Gp-9BB genotype immediately after the queen starts reproduction. Gp-9bb queens are generally absent in polygyne colonies due to the lethal recessive Gp-9b (b) allele that causes the death of homozygous b females soon after their eclosion (Ross 1997). Most queens in polygyne fire ant colonies are heterozygotes. A stable polymorphism exists between the Gp-9B (B) and Gp-9b (b) alleles. This is maintained by the selection against Gp-9BB queens that is compensated by the decreased viability of Gp-9bb queens in the polygyne form (Keller and Parker 2002). The protein product of the Gp-9 region is believed to be a molecular component in the chemical recognition of conspecifics, enabling the workers to discriminate and to recognize potential egg-laying queens in a colony. Through this means queen number and social recognition are believed to be regulated in fire ants (Krieger and Ross 2002). Wang et al. (2008) recently revealed the likelihood of a more complicated mechanism of control through chemical communication. By using mRNA microarray analyses of thousands of genes, they indicated that the polygyne behavior was potentially mediated through additional tightly linked genes. Some of these genes are in themselves odorant-binding protein genes whose function could reasonably be involved in the control of the number of queens. Another expression study (Leal and Ishida 2008) has also cast doubt that the Gp-9 gene product is the solitary cue controlling this complex behavior. Polygyny in the hybrid imported fire ant was reported based on morphological and behavioral characters by Glancey et al. (1989). Menzel et al. (2008) verified the Gp-9b allele to be detectable in hybrid colonies by using PCR primer pairs developed by Valles and Porter (2003). A study was initiated in a hybrid imported fire ant population to identify the origin and to confirm the association of phenotypic and genotypic characters of polygyny. The polygyne phenotype, by definition, is the presence of multiple inseminated queens in a colony. Genotypic characters are defined by the presence of molecular markers coding for the different amino acid replacements that cause the expression of polygyny in a colony. Ants were collected from a site in Lauderdale County, Mississippi and stored in hexane for species confirmation and in ethanol for DNA isolation. Specimens previously collected at this location had been shown to be hybrid imported fire ants. Three colonies were brought to the laboratory in five-gallon buckets for identification of the number of dealates in each colony. Ants were separated from the soil by sieving in a screen mesh through running water. Dealated female ants, which were surrounded by worker ants likely due to pheromonal activity, were collected as they were believed to be mated queens (Glancey et al. 1975). The abdomens of the putative queens were dissected to examine the spermathecae as described in Fritz et al. (2006). Total DNA was extracted individually from 12 adult worker or diploid male ants in each colony by using the Epicentre® MasterPure DNA purification kit (Epicentre, Madison, WI). The head and thorax tissues of each ant were placed in a 1.5-ml micro-centrifuge tube, frozen in liquid nitrogen, and then ground by using a pre-chilled sterile pestle. The Epicentre protocol for animal tissues was followed from this point forward. Total DNA was eluted in TE buffer and stored at –80 °C. Males encountered during our collection were dissected to observe gonadal development, which might also provide evidence of social form. The species of the fire ants was identified by using gas chromatography and mass spectrometry (GC-MS). A total of 100 to 150 adult worker ants per colony were collected by using an aspirator and placed in 5 ml of hexane. Ants were soaked in hexane for at least 2 days to transfer cuticular hydrocarbons and venom alkaloids from the ants. Hexane samples were taken to the USDA Agricultural Research Service in Stoneville, Mississippi, and GC-MS analysis for species/hybrid identification status was performed as described by Menzel et al. (2008). Multiplex polymerase chain reaction was used to identify the presence or absence of Gp-9 B and b alleles in at least ten adult workers or diploid male individuals from the three hybrid imported ant colonies. The primer pairs used were designed by Valles and Porter (2003) to capitalize on the nucleotide substitutions between the two allele forms that are found in the United States. A monogyne individual (Gp-9BB) yields only the 517-base pair (bp) band, whereas a polygyne heterozygous individual (Gp-9Bb) generates two amplicons, of 517 and 423 bp. The smaller band will only be produced from the genetic template with the Gp-9b polygyne allele. To corroborate the presence of B and b alleles, a PCR/RFLP assay was conducted as described by Krieger and Ross (2002). Total genomic DNA was amplified with primers Gp-9_169.for (5′-GCCAGCACAAAACCAATC-3′) and Gp-9_490.rev (5′-GTATGCCAGCTGTTTTTAATTGC-3′) and then digested with BsaAI restriction enzyme. 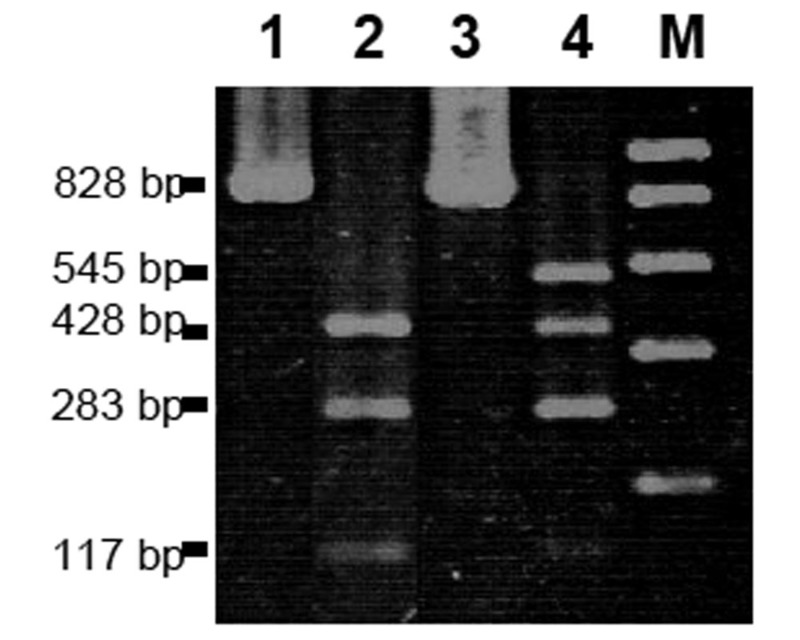 The digested products yielded two bands, 545 and 283 bp, for the B allele and three bands, 428, 283, and 117 bp, for the b allele once electrophoresed on an agarose gel. The RFLP pattern from a heterozygous polygyne individual appeared as a grouping of four bands (545, 428, 283, and 117 bp). After confirmation of polygyny by identifying the B and b alleles from both the above PCR reactions, the target region of Gp-9 was cloned and sequenced by using two sets of primers. As the first pair, Gp-9_169.for and Gp-9_490.rev, covers only a portion of the Gp-9 region, additional primers were designed by using Primer3 software (Rozen and Skaletsky 2000). A forward primer, Gp-9_163.for (5′-CAATGCCCTTATTGCATGTAGA-3′), and reverse primer, Gp-9_1105.rev (5′-CATGGGAAGACGTTATGAAAAA-3′), were designed to include the other coding regions of the amino acid replacements in the Gp-9 region of a polygyne individual (GenBank accession number EU220181) believed to be associated with polygyny in S. invicta. Total genomic DNA was used for amplification with the new primer pairs (92 °C [2 min], 30 cycles of 92 °C [20s], 51.0 °C [30s], and 72 °C [1 min], followed by 72 °C for 2 min). PCR products amplified with both primer sets, Krieger and Ross’ Gp-9_169.for and Gp-9_490.rev and our newly designed Gp-9_163.for and Gp-9_1105.rev, were cloned into pGEM-T Easy vector (Promega, USA). The resulting recombinant plasmids were transferred into Escherichia coli Top 10 competent cells (Invitrogen, USA). The cloned products were sequenced commercially (MWG Biotech, Huntsville, AL) for three individual ants for each allele. The sequence, comprising all critical amino acid substitutions at different positions known to be associated with polygyny, was approximately 1,600 bp in size (Krieger and Ross 2002). Molecular data generated in this work were compared with sequences available in the NCBI/GenBank by using the BLAST (Altschul et al. 1997) on-line resources of NCBI. The sequences were aligned by using Clustal V within Megalign (DNASTAR Inc., Madison, WI). The results obtained from GC-MS analysis indicated that ants of the three colonies collected from the location were hybrid fire ants. After thoroughly searching each colony, two dealated females were found in one of the three colonies. After dissecting the abdomens of the two dealated individuals, we found spermathecae with sperm and the two individuals were confirmed as inseminated queens. In another colony sterile males with undeveloped testicular lobes were found, and the vasa deferentia of these males were transparent and devoid of sperm. The presence of sterile diploid males is known to be an indicator of polygyny (Ross and Fletcher 1985). At least six adult workers from each colony and a control polygyne S. invicta individual produced both the 517 and 423 bp bands (Fig. 1) when tested with primer pairs designed by Valles and Porter (2003). The 423 bp band provided evidence for the presence of the b allele, a molecular indicator of the polygyne form in the hybrid imported fire ant. Typically the Gp-9 genotype for an individual ant in a polygyne mound is either Gp-9Bb or Gp-9BB. All three of the mounds examined exhibited these two genotypes and two of them also had at least one individual with the Gp-9bb genotype. The latter condition indicated that at least one of each of the two colonies’ polygyne queens mated with a polygyne male (Gp-9b). Figure 1. Results of polymerase chain reaction (PCR) using oligonucleotide primer pairs targeting Gp-9 locus. Lanes 2, 3, and 5 are heterozygote (Gp-9Bb) hybrid individuals with both B (517bp) and b (423 bp) alleles. Lane M is the marker. Lane 1 is a hybrid individual with only the B allele (Gp-9BB). Lane 4 is a hybrid individual with only the b allele (Gp-9bb). In the PCR/RFLP assay, total DNA was amplified by using the primers developed by Krieger and Ross (2002) and digested by using the BsaAI restriction enzyme. 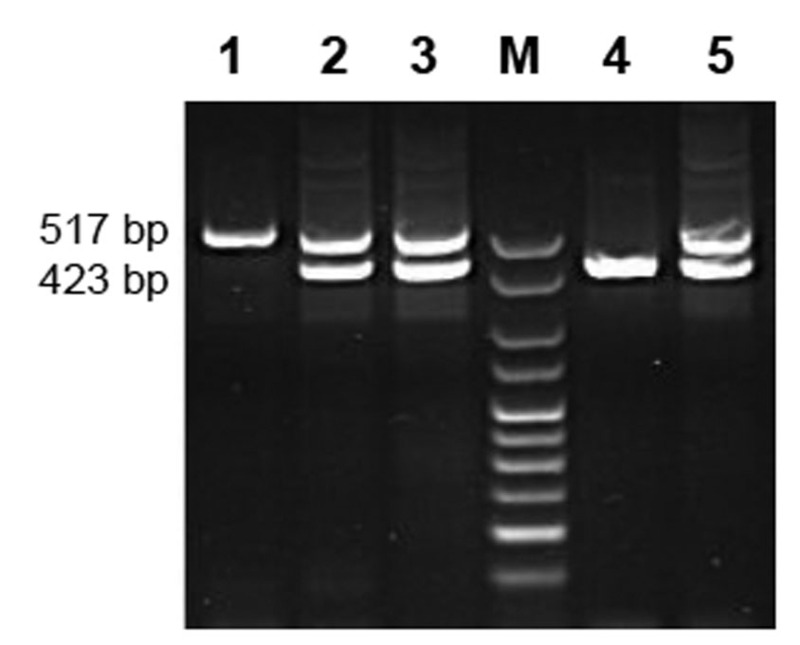 Multiple workers from the colony with the two confirmed queens, and some collected from the colony with sterile males, were heterozygous (Gp-9Bb) individuals and yielded 545, 428, 283, and 117-bp bands when visualized by using agarose gel electrophoresis (Fig. 2). The sterile males tested were all shown to be homozygous (Gp-9bb) as they yielded only the 428, 283, and 117 bp bands (Fig. 2). All the evidence above supports the existence of both the B and b alleles in the hybrid fire ant colonies sampled in our study. Figure 2. Results of PCR/RFLP assay. Lanes 1 and 3 are undigested PCR products. Lane 2 is a hybrid male individual with only the b allele (Gp-9bb) yielding three fragments (428, 283, and 117 bp). Lane 4 is a hybrid worker with both B and b alleles yielding four fragments (545, 428, 283, and 117 bp). Lane M is the marker. A 1,574-bp sequence was assembled from the cloned products from PCR of both Krieger and Ross’ Gp-9_169.for and Gp-9_490.rev and our newly designed Gp-9_163.for and Gp-9_1105.rev for both hybrid fire ant B and b alleles. The hybrid b sequence differed at only seven nucleotides when compared with currently available sequences of b alleles of S. invicta from the United States. We compared our b sequence only with those that included all four codon regions listed in Table 1 (GenBank Acc. Numbers: GUO86708, GUO86709, GUO86711-GUO86715, AF427898). In contrast, there were twice as many differing nucleotides when compared with the single published S. richteri b-like sequence (AF427903). The hybrid B allele had a 99.6–99.7% match to both the U.S. S. invicta sequences (AF427894, AF427893, GU086668-GU086691, GU086693-GU086707) and to the S. richteri sequences (AF427904, AY818628, EU220046-EU220050). The derivation of the B allele in the hybrid fire ant from both parent species would be expected, as both are known to have the monogyne form within the U.S. The sequences generated in this work were deposited in GenBank under the accession numbers GQ222019 (B allele) and GQ222020 (b allele). We checked the different positions of nucleotides for amino acid substitutions in different codons that are believed to be associated with the expression of polygyny (Table 1). The hybrid fire ant Gp-9 b sequence possesses nucleotide substitutions associated with polygyny in North American polygyne S. invicta at all four codon positions: 42, 95, 139, and 151 (Krieger and Ross 2002), and differed at the 151 codon when compared to the S. richteri b-like allele found in South America. There has been no recorded evidence of polygyny in S. richteri populations in North America. The primers developed by Valles and Porter (2003) helped to identify the changes at codon positions 95 and 152 as they differ between North American monogyne and polygyne populations of S. invicta. Table 1. Nucleotide substitutions between the B and b alleles in hybrid fire ants. The main objective of the study was to confirm the association of phenotypic and genotypic characters of polygyny in the hybrid imported fire ant colony, and to sequence the target region of the Gp-9 gene in the hybrid fire ant. An earlier study by Glancey et al. (1989) documented the presence of multiple inseminated queens in hybrid fire ant colonies, thereby furnishing phenotypic evidence of the trait. Menzel et al. (2008) showed that molecular techniques can be used to identify polygyny (presence of the b allele) in the hybrid fire ant. In this study we not only confirm this social form phenotypically but also provide the sequence for the critical region of Gp-9 for both the B and b alleles. This combined evidence provides a strong case for the existence of polygyny. The identical match for those critical regions of the b allele of the hybrid fire ant with S. invicta and the nearly 100% match of the rest of the allelic sequences confirm the origin of polygyny in the hybrid colony we sampled to be from S. invicta. All the above evidence corroborates the transfer of the polygyne trait to the hybrid imported fire ant from S. invicta during hybridization. Polygyne S. invicta populations exhibit a higher density than monogyne populations, which has potential for greater economic and environmental losses (Macom and Porter 1996). Likewise, polygyne hybrid fire ant populations are likely to cause greater damage and more economic losses than the hybrid monogyne form. Current reports suggest that the hybrid fire ant populations are expanding in the southeastern United States where both red and black imported fire ants are found. Although recent gene expression studies (Leal and Ishida 2008, Wang et al. 2008) have raised questions regarding the direct participation of the product of the Gp-9 locus in determining polygyny, there is little doubt that the Gp-9 locus is either directly or closely linked to loci directly involved with determination of polygyny. The allelic variants at the Gp-9 locus continue to serve as reliable markers for the source and form of polygyny. We thank student workers Anny Guthrie and Natalie Barker for their assistance in ant collection and DNA extraction. We also thank Ronald Christian Stephenson (Mississippi State University) for his assistance in cloning and sequencing. Two anonymous reviewers contributed to this paper through their helpful comments and suggestions. This research was supported by the USDA-ARS, Management of Imported Fire Ants Project. Approved for publication as journal article No. J-11583 of the Mississippi Agricultural and Forestry Experiment Station, Mississippi State University. Altschul, S. F., T. L. Madden, A. A. Schaffer, J. Zhang, Z. Zhang, W. Miller, D. J. Lipman. 1997. Gapped BLAST and PSI-BLAST: a new generation of protein database search programs. Nucleic Acids Res. 25: 3389-3402. Chapman, R. E. and A. F. G. Bourke. 2001. The influence of sociality on the conservative biology of social insects. Ecol. Lett. 4: 650-662. Core, J. 2003. Update: Hot on the trail of fire ants. Agricultural Research Magazine 51(2): 20-22. Gardner, W. A., S. Diffie, R. K. Vander Meer and M. A. Brinkman. 2008. Distribution of the fire ant (Hymenoptera: Formicidae) hybrid in Georgia. J. Entomol. Sci. 43(1): 133-137. Glancey, B. M., C. E. Stringer, C. H. Craig and P. M. Bishop. 1975. An extraordinary case of polygyny in the red imported fire ant. Ann. Entomol. Soc. Am. 68: 922. Gotzek, D., D. D. Shoemaker and K. G. Ross. 2007. Molecular variation at a candidate gene implicated in the regulation of fire ant social behavior. PLoS ONE 2(11): e1088. Keller, L. and J. D. Parker. 2002. Behavioral genetics: a gene for supersociality. Curr. Biol. 12: 180-181. Krieger, M. J. B. and K. G. Ross. 2002. Identification of a major gene regulating complex social behavior. Science 295: 328-332. Leal, W. S. and Y. Ishida. 2008. Gp-9s are ubiquitous proteins unlikely involved in olfactory mediation of social organization in the red imported fire ant, Solenopsis invicta. PLoS ONE 3(11): e3762. doi: 10.1371/journal.pone.003762. Lofgren, C. S., W. A. Banks and B. M. Glancey. 1975. Biology and control of imported fire ants. Ann. Rev. Entomol. 20: 1-30. Macom, T. E. and S. D. Porter. 1996. Comparison of polygyne and monogyne red imported fire ant (Hymenoptera: Formicidae) population densities. Ann. Entomol. Soc. Am. 89: 535-543. Menzel, T. O., D. C. Cross, J. Chen, M. A. Caprio and T .E. Nebeker. 2008. A survey of imported fire ant (Hymenoptera: Formicidae), species and social forms across four counties in east-central Mississippi. Midsouth Entomologist 1: 3-10. Oliver, J. B., R. K. Vander Meer, S. A. Ochieng, N .N. Youssef, E. Pantaleoni, F.A. Mrema, K .M. Vail, J.P. Parkman, S. M. Valles, W. G. Haun and S. Powell. 2009. Statewide survey of imported fire ant (Hymenoptera:Formicidae) populations in Tennessee. J. Entomol. Sci. 44(2): 149-157. Ross, K. G. 1997. Multilocus evolution in fire ants: effects of selection, gene flow and recombination. Genetics 145: 961-974. Ross, K. G. and D. J. C. Fletcher. 1985. Genetic origin of male diploidy in the fire ant, Solenopsis invicta (Hymenoptera: Formicidae), and its evolutionary significance. Evolution 39: 888-903. Ross, K. G. and L. Keller. 1995. Ecology and evolution and social organization: insights from fire ants and other highly eusocial insects. Annu. Rev. Ecol. Syst. 26: 631-656. Ross, K. G., R. K. Vander Meer, D. J. C. Fletcher and E. L. Vargo. 1987. Biochemical phenotypic and genetic studies of two introduced fire ants and their hybrid (Hymenoptera: Formicidae). Evolution 41: 280-293. Rozen, R. and H. J. Skaletsky. 2000. Primer3 on the WWW for general users and for biologist programmers. In: Krawetz S., Misener S. (eds.) Bioinformatics Methods and Protocols: Methods in Molecular Biology. Humana Press, Totowa, NJ, pp 365-386. Wang, J., K. G. Ross and L. Keller. 2008. Genome-wide expression patterns and genetic architecture of a fundamental social trait. PLoS Genetics 4(7): e1000127. Wilson, E. O. 1953. Origin of the variation in the imported fire ant. Evolution 7: 262-263. Wilson, E. O. 1958. The fire ant. Sci. Amer. 198: 36-41.